Emanuel Zeylmans' biography of his father draws on some beautifully written and moving autobiographical extracts as well as numerous other first-hand source materials. He traces Zeylmans' remarkable life from his upbringing in Holland and his first contact with Rudolf Steiner to his later attendance at the momentous Christmas Foundation Meeting and his many travels around the world to further anthroposophy. He examines the spiritual conflicts in which Zeylmans became embroiled, his life during the war years, and his innovative work in many fields. The author also catalogues Zeylmans' written works, and gives a full chronology of his life. Willem Zeylmans van Emmichoven is a compelling documentation of a leading figure connected with Rudolf Steiner. It brings to life the context of his biography - an exciting and yet difficult time in the development of new spiritual ideas - and the vibrant individuals around him. Zeylmans is portrayed as a warm, dynamic and fascinating individual, with enormous interest in people from widely differing cultures and backgrounds. A real 'world citizen', he recognized that every nation has its own particular task and importance. EMANUEL ZEYLMANS was born in The Hague in 1926. As a child he came into contact with Rudolf Steiner's philosophy through the work of his father. In 1951 he established the Dutch journal Castrum Peregrini. He then worked for many years as a bookdealer, editor and publisher. In 1966 he was ordained as a priest in the Christian Community. Later, he was instrumental in founding the Dutch journal Jonas. He has lived in Reutlingen, Germany, since 1977. 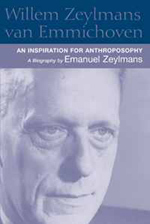 Emanuel Zeylmans is the author of a number of works, including a major three-volume biography of Ita Wegman.